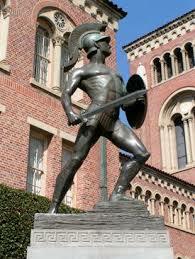 The Men of Troy will face their cross-town rivals the Bruins of UCLA on 28NOV09. The Trojans are favored, on bodog, by 13 points. UCLA has not defeated USC since 2006. One of the enduring traditions between these two schools is attempting to paint the other school’s mascot. 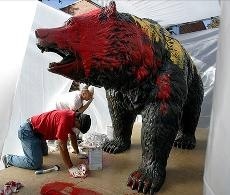 The students of USC succeeded this year when they painted the UCLA Bruin, Joe Bruin, Cardinal and Gold. 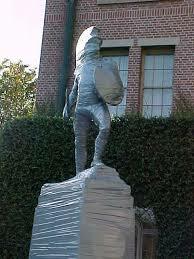 Tommy Trojan will be guarded by students until the start of the game. Tommy is also wrapped to protect him. You can watch the vigil on TommyCam. Nothing to say for the Trojans, except for the final score Stanford 55, USC 21. Hollywood couldn’t have scripted it better: Halloween night, the din of Autzen Stadium, crisp fall temperatures and No. 10 Oregon versus No. 4 USC in arguably the Pac-10’s biggest game of the season. Oregon (6-1, 4-0) sits alone atop the conference standings with no league losses, threatening the hold the Trojans (6-1, 3-1) have had on the Pac-10 title for the past seven years. The Ducks have won six straight games since an embarrassing 19-8 loss at Boise State in the opener, a game that got uglier when running back LeGarrette Blount punched a Broncos defensive end as he was leaving the field. bodog has the game Oregon +3. Dreadnaught prediction: USC over Oregon by 21 – 17.